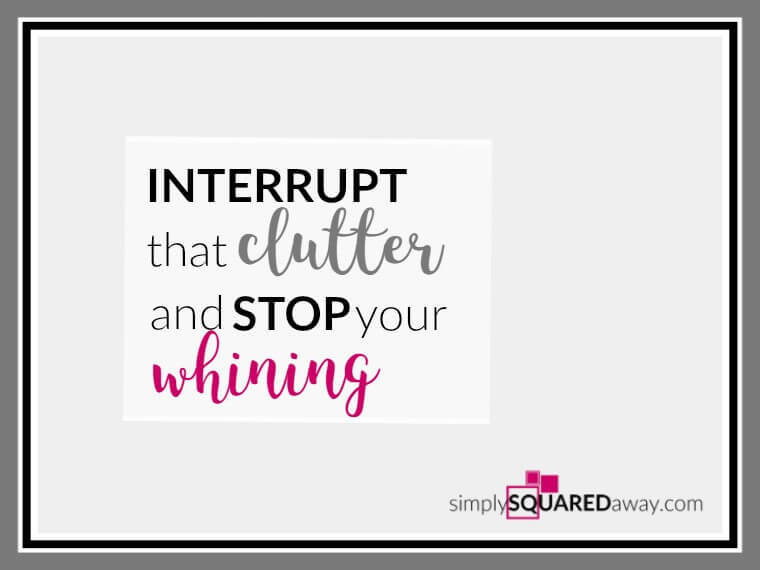 Interrupt Clutter and Stop Whining - 10 things NOT to do and 4 steps to start today. 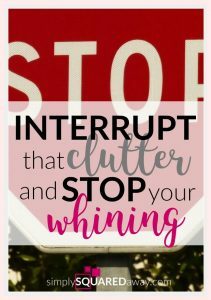 Stop clutter and stop whining. Have you been whining about not reaching your goals? Whining about not being the weight you want, still living in the clutter you hate, or loathing the relationship that’s not going as planned? I am finding that I talk and whine a lot. And, I’m sick of it. Feel like a LOSER because you don’t keep the goals and commitments you make for longer than two weeks…or two days? 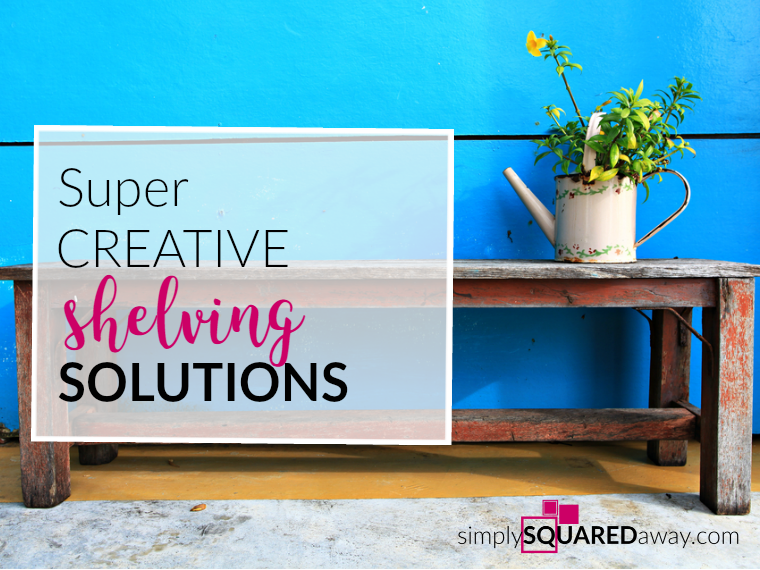 WHINE about how you cannot get your home (or life, for that matter) organized. BLAME your spouse or kids that your house is a war zone with clutter piles and lots of fighting. PANIC at the thought of someone ringing your doorbell or opening “that” door (the one that you keep closed at all times to hide the clutter). OVERCOMMIT and then hate the stress and busyness it brings (and those around you suffer because of it). GAIN WEIGHT because your cluttered life leaves you depressed, anxious, overwhelmed and ashamed of your inability to get control. Show up CHRONICALLY LATE…everywhere you go. Were you wasting time looking for things that you know you have…somewhere? WASTE MONEY because you forget to pay a bill, bought a new item you already own but can’t find, or eat out too much because your lack of planning leaves you without dinner to eat. MAKE EXCUSES for your mess. 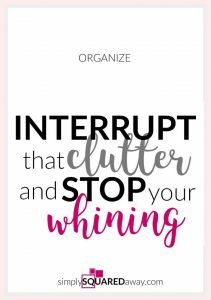 Here are four ideas that will help you stop whining and start organizing your stuff and your routines. 1. Implement a 10 minute routine. Implement one 10 minute routine today and repeat it for 30 days. An example of a 10 minute routine would be to make your bed and wipe down your bathroom countertop every morning before you leave your room. Or, process paper (mail) every day at 9:30 PM for 10 minutes. Or, drink a tall glass of water and eat a healthy protein and carb every morning right after you wake up. After 30 days, if you liked the routine, continue it and add one more habit on the end. By tying this new habit to the 10 minute routine you have already established, you’ll have a higher probability of succeeding. 2. Quantify your goal with shorter time frames. Instead of ‘this year,’ focus on ‘this month’ (30 days) or ‘this week’ (7 days). You can do anything for 7 days! Instead of saying I’m going to get healthy this year I’m focusing on shorter time frames. My friend and I are cutting sugar out of our diet for 30 days. I am working out 4 times a week for those 30 days. That doesn’t seem nearly as overwhelming as thinking of a whole year with no sugar. Open up with a friend and share your struggles. 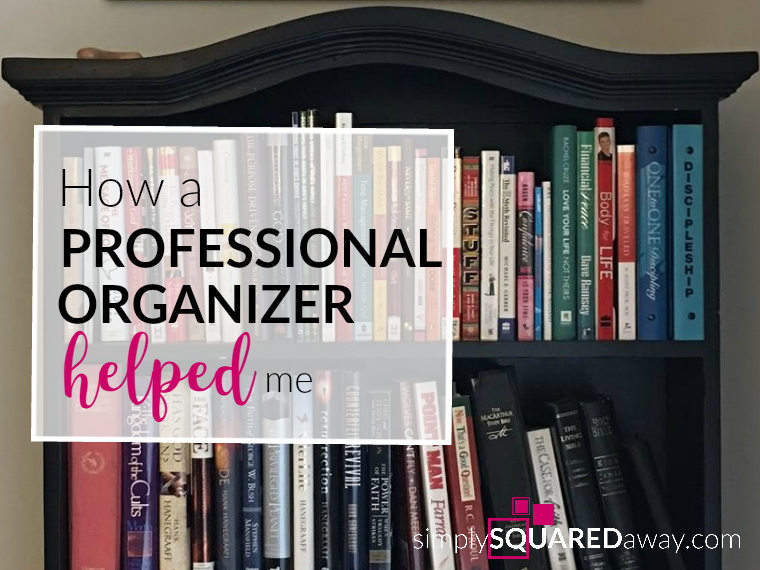 Call a professional organizer. Find an accountability partner. Write on your calendar when you will make the call for help. Schedule a time slot when you will do the 10 minute routine. Set a reminder on your phone. Set a date when your accountability partner will check in with you. It has to be written down and slotted on your calendar or it won’t get done. No more whining. You can DO this! 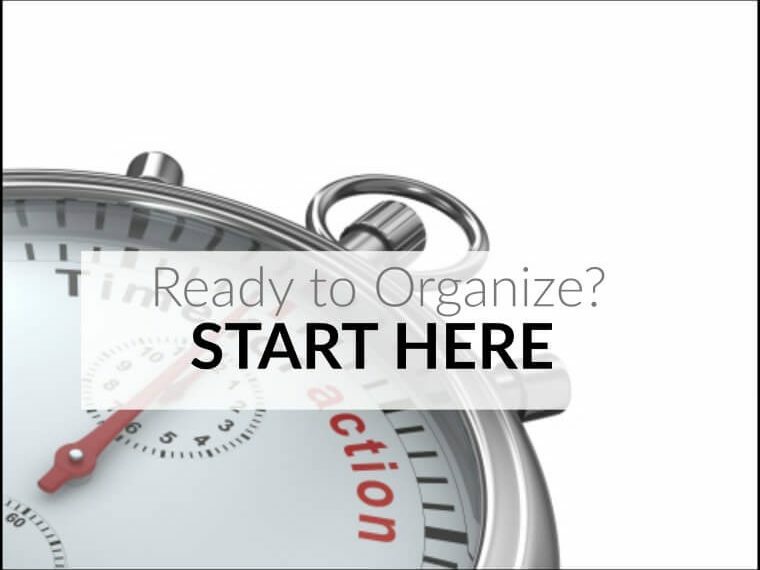 Make today the day you go step-by-step to a more organized life. Sounds like you’ve got some exciting new offerings for the new year – should be great for you and your clients! I know!! I love that you called me that day! What great information you shared with me!!! I enjoy watching your business, too! One day we must meet in person!